I know this is blasphemous to say, but I’m sad that it is Friday. This means my vacation is coming to a close and I’ll have to return to reality soon. Hope you are all having a marvelous week and I’ll be back with you on Sunday. Until then, meet my awesome Ohio-an friend Sarah. I’m sad I was only able to brunch with her once, but I’m sure she’ll find an excuse to visit me in California. Hi The Running Jewess readers! I was super flattered (and kind of confused) when Michelle asked me to do this. I blog over at Running onWords where I blather on about training and way too much information about my personal life. So when decided what to write about, I had so many options. I’m a PhD student, so I considered graduate school, but I didn’t want to scare Michelle now that she’s already committed. I thought about just putting together my favorite Jewish mother stories, but really, if you’ve met one Jewish mother, you’ve got the general idea. Then I realized we are both running bloggers, so I figured she probably meant for me to write something about that. I know, you are all incredibly impressed with my brilliance. Anyways, getting back on track here, Michelle asked me to talk to you all about what I’ve learned recently about good running form. I went to a clinic a few weeks ago with Ian Adamson from Newton Running. Newton Running makes running shoes that encourage a “natural running stride.” Ok, that’s nice, but I thought running was natural? Apparently not, because according to a lot of the new books (Chi Running, Born to Run, etc), most of us are doing it wrong. Well, according to Ian, natural running is NOT heel striking. The amount of padding in modern running shoes has allowed us to become heel strikers. If you take your shoes off and try running on something hard, you’ll notice that you start landing on the mid-foot. If you tried this at home and still landed on your heel, you probably hurt yourself. Sorry about that. Ian suggested that we spend as much time barefoot as possible. If you can’t be barefoot (or if you are germphobe like me), he actually recommended flat shoes like flip flops and no shoes with a raised heel (your running shoes most likely have a raised heel, I’m not just talking about those g-dforsaken dress shoes we try to force our feet in to). This will, according to Ian, condition your Achilles and plantar fascia to be stronger and support you better. Another step Ian recommends is focusing on keeping your feet aligned forward even when you are just relaxing. When you run with your feet turned out, you torque your hips and knees, which equals pain. Training our muscles to align correctly will hopefully carry over to running and prevent injury. He also taught us balancing drills and other strengthening techniques. Right, well if I haven’t bored you off, let’s talk about how this actually applies. I’ve been focusing on mid-foot striking and keeping my feet straight forward. I also have started working on cadence (how quickly I pick up my feet). The recommended cadence for a runner is 180 footstrikes per minute. This quicker cadence forces me to take smaller steps but move my feet a lot faster and takes a lot of the pressure off of my legs (they feel much more relaxed). I shaved a full minute and a half off of my fastest mile doing this. My 5K PR is almost 2 minutes faster than a month earlier despite the increased heat and humidity. And that’s assuming I only managed to maintain good form about half the time because it is REALLY difficult to teach muscles new tricks. Thinking about cadence is a pain and I sometimes fail on the mid-foot striking, but I know with practice, I’m totally going to be the next Kara Goucher. Or at least get under a 35 minutes 5K PR and a new half marathon PR. Even when I’m fast I’m be a little slow. Hey, I may be slow, but I’m still lapping everyone on the couch! Questions? I’ll try to check back and answer any you leave below! I must admit I had another post written and ready for today, but then I realized how amazing speed training was last night. And that, folks, is worth bragging about. When I walked out of the office, clad in my Nike running shorts and short sleeve tech tee, I was shocked at how cool it was outside. I knew it was going to be much easier to run in compared with last weeks 92° weather. Arriving at the track, I talked with coach and she mentioned that the dew point was 54° which meant that it was perfect running weather. And it meant that we’d be running 400m sprints. For some individuals 400m sprints (1/4 mile) are chump change. Not for this girl. I was very nervous to do so many. After the first, bent over and out of breath, I declared that I wouldn’t be able to maintain that speed for five more repetitions. Of course the other folks (all much faster) told me to stop being a naysayer and to give it a shot. So I did. And it hurt. The next 400m I thought I had slowed down immensely. 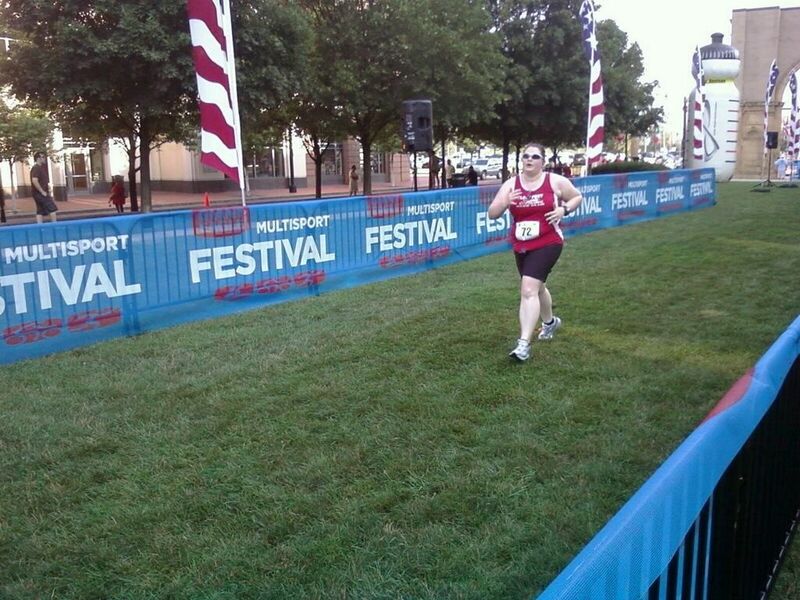 As I neared the finish line I heard coach screaming out the time. Wait, I’m going faster? That didn’t seem logical. Yet somehow I finished four seconds faster on the second lap. The rest followed the same pattern. All seven sprints were faster than I had expected to run and the last six were all seconds faster than the first. I have no idea how I pulled out the strength to do it, but man it felt good! (After I caught my breath…) I’m still on a runners high! Tell me about your recent accomplishments this week. When have you pushed your body farther than you thought it could go? Today I woke up at seven and reluctantly got out of bed. For the last year I’ve been attending group runs at the local running store, but the past four weeks I’ve been away. I decided I needed to return to my routine and get in a few miles this morning. Sadly I was the only slow runner this morning, there was no one to accompany as I ran four miles (and I forgot my iPod, grr). At first I tried to keep up with the faster ladies. Then, after half a mile, I realized that going out of the gate that fast is killer. 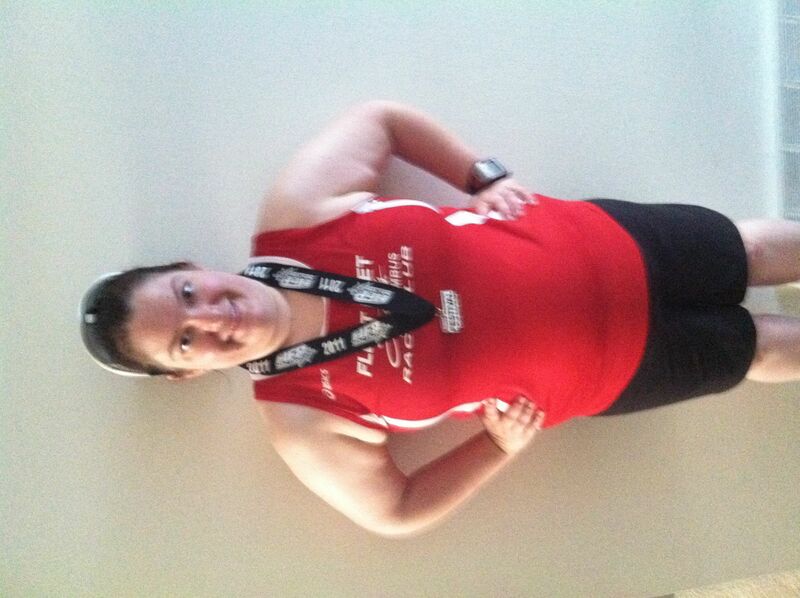 I slowed quite a bit and tried to focus on how I was running rather than my pace. At speed training this past Wednesday, Coach Brenda photographed each runner as we were sprinting around the track. Since she is a pro, she analyzed each photo to help give feedback. I was informed that I am not overstriding, which is a good thing, but it seems my arms are too high. I need to lower my elbows and keep my hands lower than my waist. If I can learn to do this, I will waste less energy (and maybe go faster?). 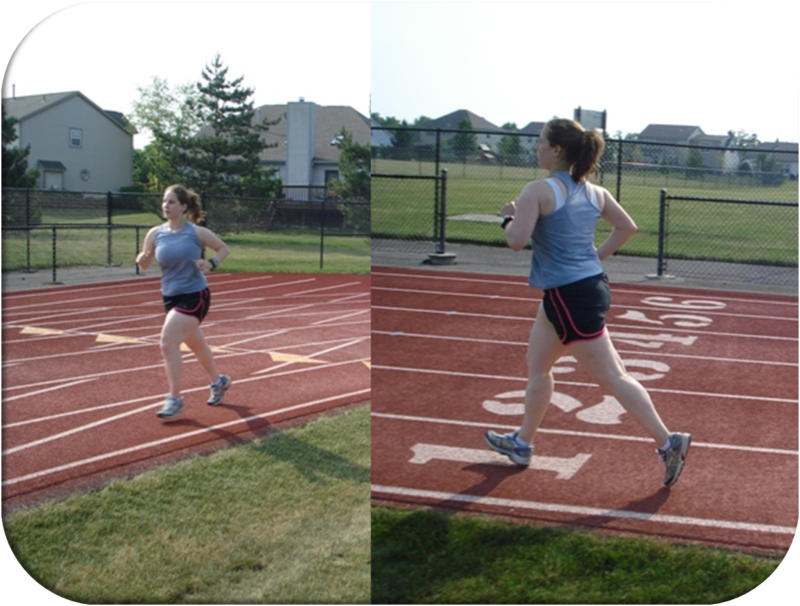 I’m not horribly proud of how I am running in the second photo. As you can easily see, I’m blatantly heel striking. I’d like to blame the fact that I was tired. It was 92° and horribly humid, we ran 3×200, 400, 3×200, 400, 3×200. But who knows when that photo was taken, it could have been my first lap around. So what does this mean for me? I need to focus, to really consider how I’m holding my upper body and change how I land. I thought about that this morning, trying to lower my elbows and relax my shoulders. It didn’t work as naturally as I’d like, but practice will (hopefully) make perfect. Right? Help me: Do you have any suggestions on how to improve your form? What techniques do you use to keep proper form while running? Have you entered my Coach’s Oats giveaway? You should! Do it for a chance to win a week’s worth of oat deliciousness.